This pyramid-inspired resort sits between a 300-yard, white-sand beach and Nichupte Lagoon. Its huge pool stretches 125 yards along the beach. 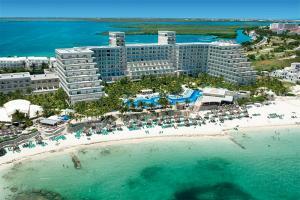 Riu Caribe features include wonderful architecture, a beach, plus 506 ocean view guest rooms. Choose from a variety of restaurants, bars and facilities with a relaxing atmosphere and all-inclusive, 24-hour service. Amenities include three pools, five restaurants and five bars. Located in the heart of the hotel zone, minutes from shopping, golf, nightlife and fancy restaurants. Only 30 minutes from the Cancun International Airport and 10 minutes from downtown. Albatros Restaurant - complete renovated, with buffet dinning and cooking stations, Gaviotas Restaurant - situated under a palapa with an amazing view of the Mexican Caribbean, Maria Margarita - serving traditional food with a fine wine selection, The Pizzeria - featuring specialty pizzas with ocean view dining, Lobby Bar - with an upbeat atmosphere, Swim Up Bar - featuring a variety of drinks, either inside the pool or in our swings, New Shangri-La Asian Restaurant - dinner buffet, new Sports Bar.